History is full of epic, violent battles, incredible weaponry, fierce soldiers and warriors from all over the globe. Tracing the history of warriors from the Stone Age all the way up to the Crusades, fascinating facts and insights into tactics from the battlefield are revealed alongside kid-friendly, detailed illustrations. Delve into the lives of Alexander the Great, Joan of Arc, and Genghis Kahn. Follow the stories of Celtic warriors, Shaolin Monks, Vikings, Knights, and Samurai, all while learning about weaponry such as sword fighting, bow and arrows, martial arts and even poisonous beetles! Iris Volant is a writer and researcher from London who specializes in nonfiction for children. Joe Lillington was born in London and studied illustration at Falmouth University. He was recently commissioned to illustrate the cover of Stew Magazine, illustrated a short story in AMBIT magazine and has exhibited at Light Grey Art Lab shows, and the Just Us collective show. 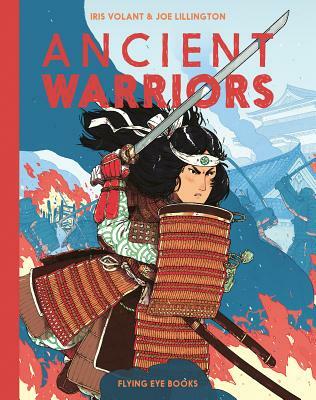 "[Ancient Warriors is] absorbing, [...] and a fascinating introduction"
"The mixture of cultures and genders throughout the book is diverse, and the inclusion of famous female generals and warriors (from Boudicca to Tomoe) is noteworthy."